One of the most popular upgrades an individual tends to make to his AR-15 is some type of handguard with rails. Having rail sections available so that mission specific accessories can be mounted is an important and maybe even necessary feature. When handguard rail systems originated, they were fairly bulky items with a large diameter (usually a good bit larger than standard, two-piece, plastic handguards). 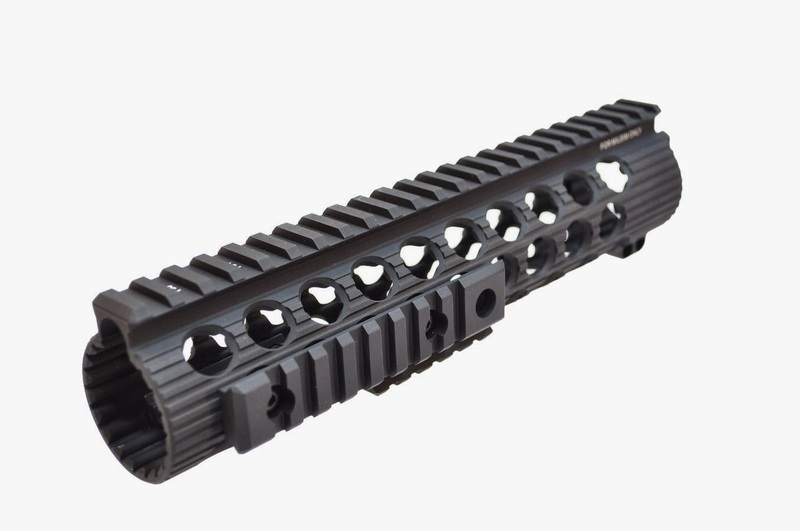 In the last couple of years, many manufacturers have begun to offer handguard rail systems in their product line that have a much more slim profile, with new design benefits like customized rail mounting locations, and a more comfortable exterior and profile for the shooter. Rail sections can be positioned only where you need them, thus leaving the rest of the handguard in a more smooth, comfortable state for your support hand position (as opposed to the entire handguard being covered in rails and feeling like a cheese grater). In this blog post, we will discuss a few of the handguards that we offer at www.del-ton.com that fall into this category. Handguards like these have been standard, installed parts on some of our rifles...like our earlier DTI TRX model and our current "flagship" model, the DTI Evolution. We also offer these handguards as parts for those who would like to install them on their AR-15. The models we will feature in this post are also all free floating, offering the opportunity for increased accuracy. Yankee Hill Machine (YHM) products have always been some of the most in demand offerings in our product line at Del-Ton. Their new SLR (smooth, lightweight, railed) handguard comes in lengths suitable for any gas system length/setup and the thickness of the handguard's walls does a fair job at preventing heat transfer to the shooter's hand. This is typically only a problem when firing at a high rate for an extended period of time, but some handguards of this style from other manufacturers have a more thin wall and heat can be felt more readily. The thinner wall in those handguards may weigh a bit less and so there is always a "trade-off" (as in all options for your AR-15, your choice should be dependent on YOUR application). Even so, the SLR is still a very lightweight option. Del-Ton offers a couple of models from Troy Industries that have these features as well. TheTroy VTAC Alpha Rail is available in various lengths for your particular gas system length and has long, oval vents. These vents are the locations where Troy rail sections can me mounted according to your specific needs. Comfortable ridges that run parallel to he handguard offer increased support hand grip The Troy Alpha Rail is also available in a variety of lengths, but has round vents/rail mounting locations. There are two variations to this product, one has an integral, flip-up front sight built into the rail, one does not. Troy Squid Grip inserts can be placed in the round vent holes to provide increased grip for the areas of the handguard where you do not desire to mount any of their rail sections for your accessories. AR-15 parts and options are ever evolving and these products are worthy of consideration as upgrades to your rifle. DTI is committed to providing AR parts that will help you employ and enjoy your rifle, and we're always looking to add innovative, quality parts to our product line to help you do just that. Thanks for reading our blog. If you have any questions about the AR-15 rifles we produce at DTI or the parts we offer, please contact us.